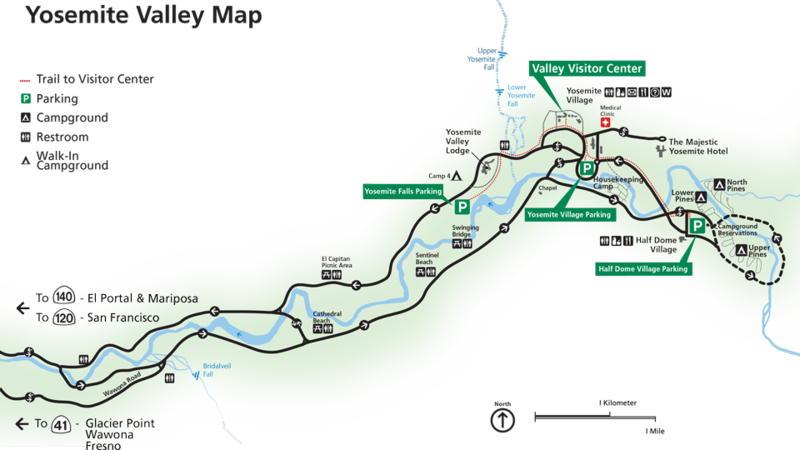 Yosemite West is conveniently located midway between Yosemite Valley and the Wawona/Giant Sequoias Mariposa Grove area. 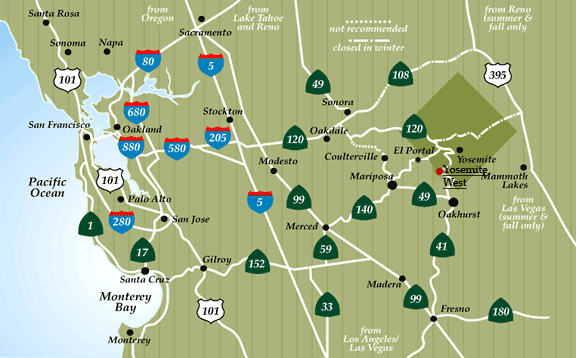 Drive to Yosemite National Park; after entering the park through one of the 4 entrances, proceed to Yosemite West. * From San Francisco and Sacramento, driving time is approx. 4 hours via Hwy. 120. * From San Jose, driving time is approx. 4 hours via Hwy. 140. * From Los Angeles, driving time is approx. 5 1/2 hours via Hwy. 41. * From Reno - During summer only, driving time is approx. 4 hours using Hwy. 395 and Hwy. 120. * From Fresno Yosemite International Airport, driving time is approx. 2 hours via Hwy. 41. Glacier Point 17 miles spectacular vistas ... a must see! ... view 3,214 feet down to Yosemite Valley. NON-SMOKING and NO PETS: The Yosemite Sunset House property is smoke-free (inside and outside) and no pets allowed. We reserve the right to inspect premises during your stay and you will be charged for non-compliance and ordered to leave immediately. We may enter the property without your consent to make repairs, check on results of repairs, and whenever there is considerable reason to suspect the property needs a safety inspection. STAIRS: Due to the fact that there are 53 steps to reach the upper level (the house is not suitable for those with walking difficulties) the pay-off is a beautiful, unobstructed view towards the western horizon, over the forest top! We request that guests honor the tranquil forest setting by keeping the noise level to a minimum (playing loud music, loud TV, yelling or otherwise loudly congregating outdoors). The neighbors in Yosemite West thank you for your consideration. This home is not child-proofed. Families w/ children under 6 years old must bring their own waterproof mattress overlays or pads. No "party animals", this is not a "party house"; you will be asked to leave and will forfeit all monies paid in case of non-compliance. CHECK-OUT TIME: by 11 am SHARP! NIGHT OWLS, beware!!! - Quiet Hours house rules (10pm to 7am) strongly enforced. NO FIRES ... no candles, incense burning, or any other type of fire is allowed in the house, on the decks or anywhere on the property. Security deposit is refundable except for damages, missing items, phone charges, and extra cleaning service (if needed). Balance of the refundable deposit will be returned to renter within 15 days. For parties up to 4 guests, we will use your credit card on file in lieu of a security deposit. Phone: one land line (extention in both units) for local calls only; most cell phones do not work in Yosemite, bring your calling card to use with our land line. There is a public phone at the entrance to the Yosemite West development by the mail boxes. Your faxed reservation forms: Your faxed or pdf forms must be returned to us within 24 hrs from your receipt of these forms to HOLD your dates. Payments: Your payment in full must be mailed within 2 working days from the date we received your completed forms to secure your dates. Payment method: Payment to be made by personal check when plenty of time is available for mailing and processing it and credit cards or PayPal for last minute bookings. Reservations with arrival dates within 3 months: Full payment is required at reservation time to secure your dates. Advance reservation payments: arrival dates beyond 3 months and total rental costs over $800, renters have the choice of paying 50% at reservation time, and balance, by 60 days prior to arrival day. International transactions incur a 5% transaction fee and can be made via credit card. Reservation changes/cancellations subject to fees and/or forfeitures, only hard copy written cancellation notices faxed or sent through the postal system are accepted; emailed requests are not sufficient. Rates may be higher for holidays and special events. Rates are based on specific unit, season, and number of people. Occupancy above the maximum number of 8 guests in total, in both units together, is not allowed. In the Sunset House unit a maximum of 5 guests is allowed. In the Red Door apartment a maximum of 2 adults and one young child is allowed. You must declare all guests in your party, you will be charged for undeclared guests $100/night and be subject to eviction. * If canceled before 60 days of arrival - the cancellation fee will be $150 admin. plus any bank, credit card or PayPal fees incurred. * If canceled within 60 days or less of arrival - refund will be given only if re-rented for the same period and same rate, less 25% cancellation fee, with a minimum of $100 plus tax. * No refunds for cancellation with less than 15 days notice. * If re-renting is only partial, your refund will be prorated in the same proportion less cancellation fee as described above. * ABSOLUTELY NO REFUNDS DUE TO WEATHER. * NO REFUND for reduction in number of guests or number of nights after reservation has been accepted by owners. * There is no refund for events beyond our control: weather and road conditions, flight cancellations or delays, personal emergencies, change in vacation plans, etc. * Prorated refunds will be given for: county road closures longer than 12 hours; electric power or water shut down or plumbing not working for longer than 12 hrs. * No refunds after check-in for any reason (except for situation described on line above). * Changing dates: once a reservation has been accepted, if guests wish to change their already booked dates, and there are available dates, they may do so only at the discretion of the property owner/manager and without a reduction of nights or number of guests; the re-scheduling fee is $50 and $100 for holiday periods. * Refund checks will be mailed within 10 working days, and only to the address on file. * Refunds of any payments made via a credit card or PayPal will incur a 5% financial transaction fee. * Purchasing TRAVEL INSURANCE is strongly recommended to all renters to minimize financial loss due to unforeseeable events. * Failed Reservation/unit unavailable: in the extremely rare and unexpected event that the unit reserved becomes unavailable for rental, owners are obligated to return only moneys renters already paid; renters agree to hold owners harmless from and against any claims, liability, losses, and expenses in connection with a failed reservation. Leave the unit(s) in the same clean condition as you found it/them! Extra Cleaning fees: please leave the unit as clean as you found it - staff will inspect premises after your departure, a clean unit means no extraordinary cleaning fees later; this extra fee, if any, will be determined by housekeeping personnel. Please leave all furniture in its original position. You are required to broom clean the unit, wash all dishes used. BBQ grills must be cleaned immediately after each use - a charge of $40 will be made to your credit card for each grill left uncleaned (if you don't clean it, we must request previously unscheduled extra time for the cleaning crew to accomplish this task!). Firewood is included in rates during winter stays but remember: wood stove not to be used by renters during dry weather, drought years, and summer - no exceptions! Renters to sign the "Waivers" document required by owners and provide a signed credit card authorization. Minimum age: We require the renter to be at least 25 years old - proof will be requested. Owners are not responsible for adverse conditions: snow, road, weather, and/or utilities or for the unavailability of the house for renters' use due to natural causes or circumstances beyond owners' control, including the unavailability or untimely housekeeping services. By making a reservation you agree to all the house rules explained above. If you have any questions, contact us before making a reservations. Thank you! Owners are not present at the property; local housekeepers are nearby. Both units in this duplex property are rented to vacationers. There is no hotel style services such as front desk, night clerk, concierge, daily maid service, etc. Renters may have to rely on themselves for everyday chores and those chores typical to snow country living. Emergency service providers and repair men come from distant locations - 1.5 to 2 hours away - patience is in order at this remote location. Please ask any questions about renting this property before booking your reservation. We welcome your questions as well as your feedback ... please let us know how we may improve travelers' experience at this property.